High temperatures today reached only the middle 30s, and these temperatures mostly occurred in the morning. Temperatures cooled a few degrees in the afternoon, and strong winds out of the northwest about 20 mph produced afternoon wind chill values in the upper teens and lower 20s. A high pressure system near Lake Superior is giving us clearing skies. It is also steering winds out of the north into our area, bringing the colder temperatures. This high pressure system will move to Indiana tomorrow, which will shift the wind direction out of the west. 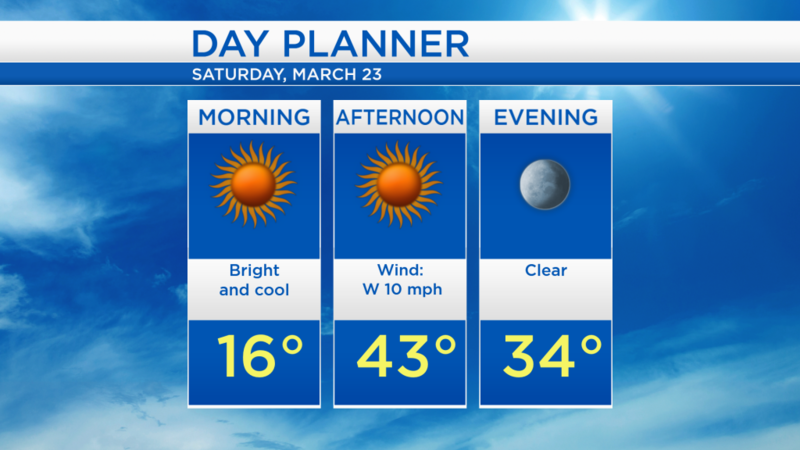 We will see warmer temperatures tomorrow afternoon with plenty of sunshine all day. Skies will become clear tonight as low temperatures will cool to the lower teens. The early-morning will start with temperatures in the teens, then highs will warm to the lower or middle 40s in the afternoon. Temperatures will then remain milder through Sunday. A weak disturbance could generate a few showers Sunday afternoon or evening. More significantly, winds will shift out of the north after that disturbance moves through our area, which will bring in colder temperatures (again) for Monday. 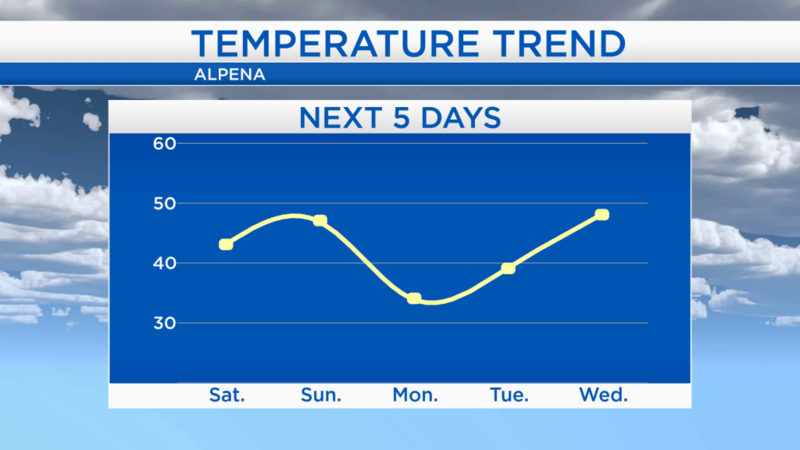 By the middle of next week temperatures will climb again, peaking in the lower 50s. 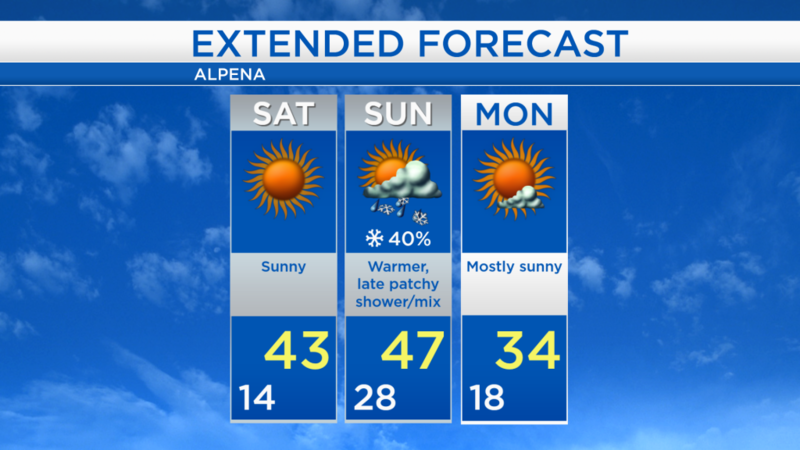 The weekend will start with sunny skies on Saturday, and temperatures climbing to a high of 43 degrees in the afternoon. More cloud cover will build on Sunday along with a chance of showers or a wintry mix late-day, and highs in the upper 40s. Temperatures will cool again on Monday, though we will see more sunshine Monday and Tuesday. For the rest of Northeast Michigan’s weather forecast, watch the latest weather video by clicking the weather tab at the top of the page.